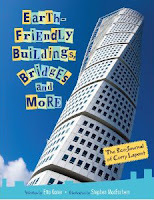 Kaner, Etta and illustrated by MacEachern, Stephen Earth Friendly Buildings, Bridges, and More 64 pgs. Kids Can Press, Ltd, 2012. $15.39. (Rating: G). Told from the point of view of a 12year old Corry, this book is her scrapbook of buildings, dams, bridges, and more. There is an eco-friendly focus, lots of information, jokes, and experiments. The roles of different types of engineers, planners, and architects are discussed. A must have for your school library. This book does a great job of explaining engineering in basic terms, while skillfully mixing in a story, characters, and fun. There are fun illustrations, and tons of color pictures. Its informative and entertaining. ELEMENTARY– ESSENTIAL Reviewer: Stephanie MLS graduate & Author.